Friday April 29th, 11:00pm - 2:00am: Vogue 4U Fashion Show presented by 4U Fashion Boutique at Roxy’s Lounge with after party featuring music by DJ Doug Strong. 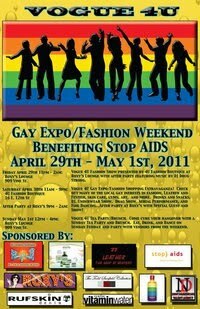 Roxy's Lounge - 909 Vine St.
Saturday April 30th, 11:00am - 9:00pm: Vogue 4U Gay Expo/Fashion Shopping Extravaganza! Check out many of the local gay inerests in Fashion, Leather and Festish, Skin Care, Gyms, Art, and More. Drinks and Snacks, DJ, Underwear Show, Drag Show, and Fire Dancing...After party at Roxy’s! 4U Fashion Boutique - 16 E. 12th St.
Sunday May 1st, 12:00pm - 4:00pm: Vogue 4U Tea Party/Brunch. Come cure your hangover with a Sunday Tea Party and Brunch. Eat, Drink, and Dance on Sunday Funday and party with vendors from the weekend. Schedule of Performances and Demonstrations to come! Sponsored By: 4U Fashion Boutique, Roxy's Lounge, Leather 77 at The Serpent, Sebatian Rey Skin Awareness, Stop AIDS Cincinnati, Absolut Vodka, Rufskin Denim, Todd Sandfield Collection, New Dimension Talent Agency, and Vitamin Water.